The internet is continuing to be the most critical sales and revenue channel for hotels and the lodging industry. Travel sites have become the most widely utilized online channels for booking travel, lodging, and complete vacation packages for millions of traveler around the globe. 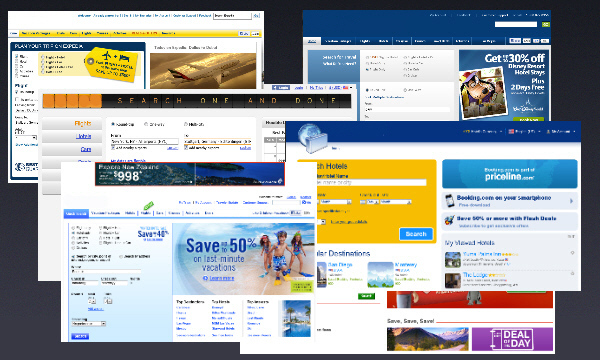 According to Media Metrics, in any given month, one in four Web users visit a travel site, such as Expedia and Travelocity, to search for information, find the lowest rates, reserve rooms, trips, airline tickets and all-inclusive travel packages. As the lodging and hospitality industry recognizes the significance of travel sites for hotel exposure and representation, hotels must seize and capture every opportunity to maximize their presence and position on the major travel sites to stay competitive and effective in this online market. While your hotel's website is a primary vehicle for online sales and marketing, the role of intermediary travel sites is crucial if you want to remain competitive. It is essential that every travel site that includes your hotel reflects your property accurately. RSE will set up the distribution channels for your property and create compelling content and information that potential guests are searching for. Online distribution channels are creating a paradigm shift on the internet which is radically changing the competitive landscape for hotels and lodging properties. In order for the hotel to harness the power of the internet, it is critical for hotels and lodgings to adapt to the changing environment and determine how they will best compete in the new world. As a first step, we understand the hotel's current revenue, client profile and the sales channel strategy. We will analyze a hotel's booking patterns and revenue profile and based on these factors, we provide strategic advice to our clients on how to maximize the Revenue for properties while still maintaining high ADR's and competitive positioning. We will provide strategies for you to compete when it comes to reservations and bookings on these distribution channels. Our unique differentiation comes from our understanding of how the GDS and travel sites work and the consumer behavior for booking a hotel while surfing the travel site. While there are hundreds of 3rd party distribution channel sites available on the internet, RSE focuses only on the premium sites that carry most of the traffic such as Expedia, Hotels.com, Travelocity, Orbitz, etc., so that our clients can get the most Return on Investment for their Distribution Channel Strategy. RSE sets up the contracts and provides the distribution channel website with relevant information about the hotels that results in maximum conversion. We ensure that your hotels are aesthetically and effectively represented on global distribution systems (GDS) and travel sites, two critical intermediaries between your hotels and your guests. RSE's unique technique updates all distribution channels in real time to ensure that your current availability and rate structure are up to date. The property has a wide range of possible settings for each distribution channel to optimize the rates and cover additional distribution charges.